Associated Press Notre Dame QB Brandon Wimbush completed 17 of 31 passes for 297 yards with three interceptions against Ball State on Saturday. Notre Dame added a recruit to its 2019 class Sunday when Kendall Abdur-Rahman, a three-star wide receiver from Edwardsville, Illinois, committed to the Irish. The 6-foot-1, 180-pound Abdur-Rahman, who scored 34 touchdowns as a junior, visited Notre Dame with his family during the Michigan game Sept. 1. He is the No. 285 player in his class, per 24/7 Sports and the No. 5 player in Illinois. It is the 18th committment in the Irish's class, which ranks No. 12 nationally. It now includes two wide receivers, including Maryland's Cam Hart. SOUTH BEND – Brian Kelly knew the questions were coming. Brandon Wimbush had just thrown three interceptions against Ball State after spending the offseason fending off a challenge for the starting quarterback job from backup Ian Book. So, had Kelly thought of putting Book in when Wimbush struggled? Kelly insisted there were a lot of factors in the Notre Dame offense's relative ineffectiveness against a team that went 2-10 last season: he mentioned coaching, preparation and issues in pass protection as other causes of the inconsistent performance. The coach's basic message, after the game and again in his weekly teleconference Sunday, was that Wimbush's job is safe. Wimbush often dealt with heavy pressure Saturday and hung in the pocket to deliver difficult throws with pass-rushers in his face. He finished 17 for 31 for a career-high 297 yards. And he completed seven passes that gained at least 20 yards. 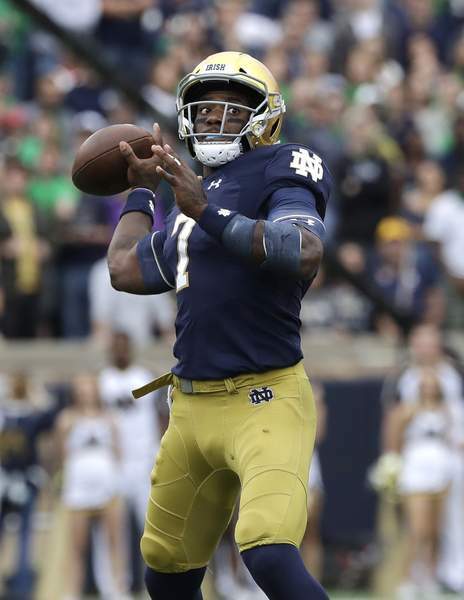 Far from talking about benching Wimbush or re-opening the quarterback competition, Kelly made sure to note the positives that he saw in the second-year starter's performance. “I think we'll make progress off of today with Brandon,” the coach said. “On the (run-pass option) that got deflected for a pick (in the third quarter), I thought it was really good timing. The ball came out the way it's supposed to. He threw a couple of seams that were really deliberate, things he hadn't done before. As Kelly mentioned, one of Wimbush's interceptions was tipped at the line of scrimmage and bounced off wide receiver Miles Boykin's hands before ending up in the Cardinals' possession. The other two picks, however, were the result of a poor read or a poor decision. The first, a deep ball in the second quarter, was thrown into double coverage. The third, which came in the fourth quarter, was a good throw to an apparently open receiver, but Wimbush missed linebacker Ray Wilborn helping underneath, and Wilborn reached out to intercept the pass. Outside of the interceptions, what made Wimbush's performance stand out was his struggles gaining yardage when he got flushed from the pocket. His longest run was 9 yards, and the Cardinals did a better job than Michigan of containing him between the hash marks. Wimbush took responsibility for his play and gave himself a “D, D-plus” grade. He admitted, “I got to be better.” He also refused to blame his offensive line for contributing to the inconsistency, though he was sacked four times. When he learned that Wimbush had given himself such a low grade, Kelly again rose to his signal-caller's defense and tried to sound a positive note.